The Brethren named below have, over the years, gave their assistance and support, to help keep our young Lodge going from strength to strength and are listed here with our sincere thanks. It is our privilege to have them among our numbers. On the 28th of October 1997 Bro. Tom McGuffie Snr. reached his 50th year as a member of this great Fraternity of ours. He was Initiated, Passed, Raised and Received his Mark Master Mason Degree at the hands of his Mother Lodge, Lodge Union and Crown No. 307 in Barrhead and Affiliated to our young Lodge on the 23rd January 1990. On the night of the 28th a deputation of 26 Brethren came from his Mother Lodge and also Brethren from Lodge St. Meddans No.1335 along with other friends from our sister Lodges to witness Bro. McGuffie receive his 50 year diploma. He was somewhat taken aback, when Bro. Director of Ceremonies brought him onto the floor of the Lodge and presented him to our R.W.M. and the assembled Brethren, as we managed to keep the presentation quiet and he knew nothing about it. Both our own R.W.M. and the R.W.M. of Lodge Union and Crown came on the level to make the presentation and all the Brethren offered their heartiest congratulations The R.W.M. of Lodge St. Meddans presented Bro. McGuffie with a replica of the Drummore Lighthouse. On 27th September 2011 Bro. Duncan Rigg reached his 50th year as a member of this great fraternity of ours and he received his 50 Year Diploma in our Lodge. 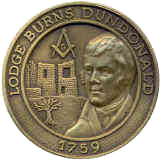 Duncan’s Mother Lodge is Lodge St. Matthew Kilwinning Dreghorn No. 549 and he was a Founder member of our Lodge. Bro. Duncan was one our of our Lodge Auditors for more years than he or we care to remember. His dedicated service as an Auditor has helped keep this Lodge going forward. On Tuesday 30th January 2018 Bro. Brian Callaghan received his 50 Year Diploma in our Lodge. Brian’s Mother Lodge is Lodge Richmond 1137 He is a Founder Member of our Lodge and he was R.W.M. of our Lodge from 2016 to 2018. Brian was presented with his Diploma by the R.W.P.G.M. of the Provincial Grand Lodge of Ayrshire Bro. Robert Little.